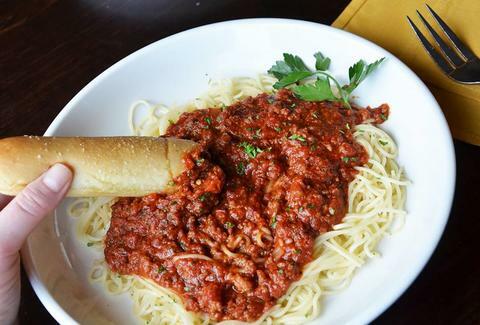 When Olive Garden introduced its $100 Never Ending Pasta Pass, they probably weren't anticipating what American hero Alan Martin would do with it. The church minister from Burlington, NC bought one of the passes back in September and has been eating an average of around 2.3 meals per day there ever since -- meals that consist exclusively of bottomless pasta. And he's still diving deeper. Apparently, Martin has eaten roughly $1,510 worth of spaghetti over the past six weeks, stretching over a total of 95 meals, at a single Olive Garden in his town, where -- just like a breadstick-slinging Cheers -- everyone ostensibly knows his name. His goal is to get more out of his $100 pass than anyone in the United States, and dammit, he is succeeding with relish. Or ragu, rather. The pass expires on November 9th, and he aims to continue eating two meals of pasta per day there until the deal ends. Adam Lapetina is a Food/Drink staff writer for Thrillist, and makes pasta at home occasionally. Read his musings at @adamlapetina.